A view of the horizon of Mercury, taken by NASA's Messenger spacecraft on March 29, 2011. The picture shows a stretch of land about 750 miles long, from top to bottom. NASA's Messenger probe became the first spacecraft ever to orbit Mercury when it arrived at the planet on March 17. While the spacecraft won't officially start its yearlong science mission until April 4, the observations it's already made hint at many discoveries to come, researchers said. The search for water ice on the blisteringly hot planet is one of the mission's driving motivations. Though Mercury's surface temperatures can top 842 degrees Fahrenheit (450 degrees Celsius), ice may survive on the floors of permanently shadowed polar craters. And about 20 years ago, radar data first picked up intriguing evidence of reflective materials at Mercury's poles that might just be water ice, researchers said. "Could ice be trapped there? The thermal models say yes, it's possible," Solomon said. "But is it water ice? There are alternative ideas." Messenger will also investigate other questions about Mercury — why it's so much denser than the other rocky planets, for example. Also, the mission team wants to learn more about how the planet's core is structured, the nature of its global magnetic field and other aspects of Mercury's composition and history. That work will start in earnest next week. In the meantime, scientists are sifting through the spacecraft's increasing pile of new Mercury photos. By the end of tomorrow, it will have snapped 1,500 photos of the planet from orbit, researchers said — more than it captured during its three previous flybys of the planet in 2008 and 2009. Messenger — whose name is short for MErcury Surface, Space ENvironment, GEochemistry, and Ranging — is still officially in a commissioning phase, during which time mission scientists are checking out its cameras and other instruments. But the probe has not been idly waiting for its main mission to start. Messenger snapped the first photos of Mercury from orbit yesterday (March 29), imaging previously unseen areas of the planet — terrain near the poles that Messenger missed on its three flybys. Bright rays, consisting of impact ejecta and secondary craters, radiate from Mercury's Debussy crater, located at the top. The image, acquired by NASA's Messenger spacecraft on March 29, 2011, shows a small portion of Debussy's large system of rays in greater detail than ever before. The pictures show the battered, crater-strewn surface of Mercury in great detail. "We are delighted to be able to see the surface at the very high latitudes," Solomon said. So far, everything is going well with Messenger's mission and its instruments. "All subsystems and instruments are on and operating nominally, within specifications," said Messenger mission systems engineer Eric Finnegan, of Johns Hopkins University's Applied Physics Laboratory. "This is a tremendous achievement for the entire Messenger team." This information could shed light on how our solar system formed and evolved — and perhaps, by extension, how alien planetary systems have come about as well, researchers said. The observations Messenger has made from orbit thus far suggest the probe will beam home all sorts of eye-opening information, researchers said. It may, for instance, help researchers learn why Mercury — like Earth — has a global magnetic field, while its rocky planet cousins Mars and Venus do not. In its first five days in orbit, Messenger tripled the number of spacecraft observations of Mercury's magnetic field available to astronomers, researchers said. "We are rapidly ramping up a much larger dataset with which to characterize the geometry of Mercury's magnetic field," Solomon said. "That will tell us a lot about Mercury's internal structure and dynamics." The $446 million Messenger probe launched in August 2004. The spacecraft is now in an extremely elliptical orbit that brings it within 124 miles (200 kilometers) of Mercury at the closest point and retreats to more than 9,300 miles (15,000 km) away at the farthest point. While Messenger is the first mission ever to orbit Mercury, it is not the first spacecraft to visit the planet. NASA's Mariner 10 spacecraft flew by the planet three times in the mid-1970s. 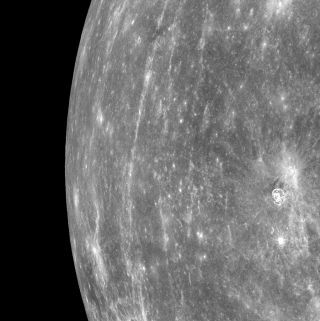 On April 4, Messenger will start mapping and studying the entire surface of Mercury, a process that is expected to require about 75,000 images. But the early science returns have whetted the appetites of mission scientists, who can't wait for the data to really start pouring in. "It's just a wonderful adventure for those of us on the science team that have front-row seats for these new data that are coming down," Solomon said. "It's a wonderful time in the history of exploration of planet Earth's neighborhood, and we are delighted to be a part of that."